This weekend our daughter Heather and I went to Springfield, MO, for Forward Baptist Church’s annual women’s retreat, where I would be speaking. The drive there was incredible, with the mountains and the leaves changing colors to a beautiful bright red, burnt orange, and lemon yellow. 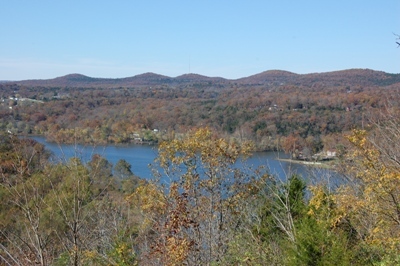 Here is the scenic view of the Ozark river near Forsythe, MO. The board had ordered black tshirts for the women, with the words in bold white, “NOT GUILTY.” They played spoons & the game Bunko. The board had a massage therapist come in to give the women a full body massage. The house where they stayed was just beautiful, with tall pillars, oil paintings, seven bedrooms, five baths, an indoor sauna room, and an outdoor whirlpool spa tub. The women said all weekend they had done nothing but prayed, cried, and eat lots of good food! It really blessed me to see the women’s board have such a heart for their women. 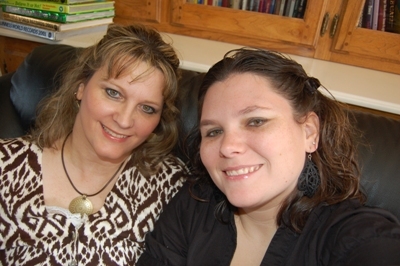 God loves His daughters! The tshirts had the numbers 4532324 [like prisoner numbers] imprinted on the front, to represent Romans as the 45th book of the Bible, chapter 3, and verses 23 and 24. 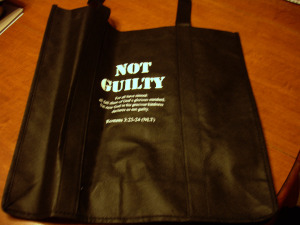 They also ordered a black bag that looked very similar to the tshirt, pictured here. The scripture God gave me for the retreat was Isaiah 49:16, “See, I have inscribed you on the palms of My hands.” Jesus took our guilt, our shame and our condemnation, and nailed it to the cross over 2,000 years ago. God also had spoken to me about the fairy tale Sleeping Beauty, which I will be sharing about more in the following weeks, as well as Barlow Girl’s song Average Girl (No more dating, I’m just waiting, like Sleeping Beauty, my Prince will come for me). As I spoke, I shared the scripture, my personal testimony, and then about the fairy tale and the song. Throughout the night I was able to pray with several women one-on-one, who sought me out privately and who needed to just know how much Jesus loved them, that He had taken away their shame and guilt. Heather was also able to talk to some women and encourage them. I was very thankful for God’s presence and anointing this weekend. He is so good! Afterward, we ate a delicious, catered bbq dinner and then Heather and I were able to watch their women’s “pajama pageant” that was done in the style of the tv show, So You Think You Can Dance? One of the board members, Becky, played the role of one of the show’s judges, Mary Murphy with her crazy, annoying laugh. She had her loud laugh down-pat. It was so hilarious! Winners received some nice prizes, such as pretty photo frames or a spa gift certificate. 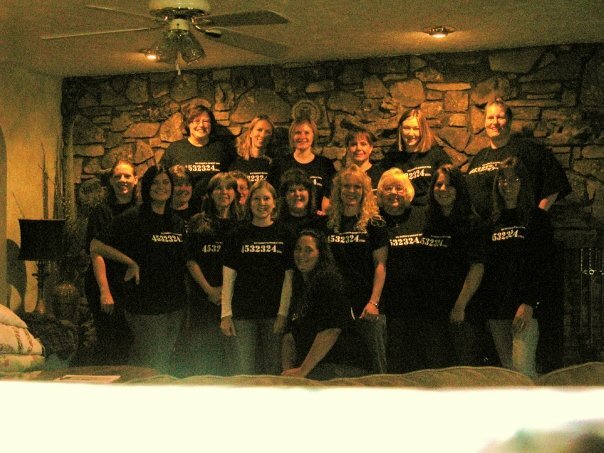 Here are the awesome ladies at the women’s retreat in Springfield this weekend, wearing their “Not Guilty” tshirts. That house was so great – I wanted to get in that whirlpool so bad! Wow! And I loved all the ladies! Did you ask your small group leader about your church having a women’s retreat there next year?